Climbing Mount Kilimanjaro is a daunting thought for most people, so when amputee Zizipho Ndlwana was approached to do the climb he had mixed emotions. Zizipho, who is an Assistant Researcher in the Sports Management Department, lost his leg during an accident in August 2010. The tragic incident impacted on more than only his physical ability. “After the accident and my rehabilitation, my view on everything changed. I am the same person looking at the world through different eyes. My perspective has changed,” says Zizipho. The climb is the brainchild of Guts 2 Glory, a non-profit organisation aimed at raising funds for disabled and underprivileged athletes and cyclists in order to help them realise their dreams of representing their country at the Paralympics. They also focus on the development of disabled athletes. Due to take place in January/ February 2014, the climb will be attempted by a South African and American team. Preparations are in full swing, with work-out regimes taking place six days a week. When he is not preparing for the climb, Zizipho along with Naomi-Jan Augustyn and Dr Sacha J. West from the Sports Management Department, and Dr Nina du Toit, from the Disability Unit, are working on incorporating athletics equipment for disabled students at CPUT. 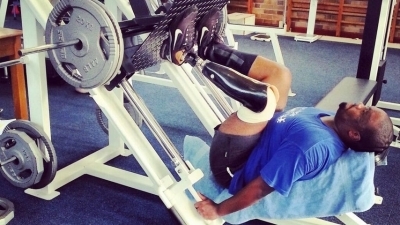 IMAGE: Amputee Zizipho Ndlwana has overcome adversity and is now set to climb Mount Kilimanjaro.